It was 2p.m. on the afternoon of May 7, 1915. The Lusitania had been struck by two torpedoes in succession and was sinking rapidly, while the boats were being launched with all possible speed. The women and children were being lined up awaiting their turn. Some still clung desperately to husbands and fathers; others clutched their children closely to their breasts. One girl stood alone, slightly apart from the rest. She was quite young, not more than eighteen. She did not seem afraid, and her grave, steadfast eyes looked straight ahead. Hurrah I have finally read my first Agatha Christie book and by Jove it was jolly good. The Secret Adversary was Agatha Christie's second work of fiction. Her first book, The Mysterious Affair at Styles was written as a result of a bet. At this point, she had previously never written. She took up a bet that she could compose a detective novel in which the reader would not be able to identify the murderer, though having access to the same clues as the detective. How amazing to think that Agatha Christies prolific writing career started out as a bet. This book follows the adventures of Tommy and Tuppence, who after setting up the Young Adventurers Ltd, try to discover what happened to the young Jane Finn, who never stepped off the Lusitania. She was believed to be in possession of some very influential papers that could compromise the future of the English government. With the help of Mr Carter, a member of the British Intelligence, Julius Hersheimmer, Jane Finn's American cousin who is searching for her and Sir James Peel Edgerton, a Q.C. they set off to find out what happened. They all go on a desperate search to find Jane Finn and the rather delicate papers before they end up in the hands of Mr Brown, the elusive leader of the Bolshevists,who will publicly reveal the papers. This was a rather enjoyable book to read and I loved the thrill of the chase as they try to get to Jane and the papers before Mr Brown. Unfortunately for me, I guessed who Mr Brown was quite early on in the book, which spoilt it just a little, as I was hoping to be completely wrong and utterly surprised when the real Mr Brown stepped forward. Tuppence, was a bit of a go getting girl, who didn't let anyone stand in her way. She would so easily fit in to today's modern society, however I think back than her unfeminine ways may have caused a storm. The only character I didn't really like was the American, Julius Hersheimmer. I think Christie gave him what I would consider a typical American personality as seen through the eyes of the English upper crust during that era. He is loud, brash, in your face, hot headed and thinks nothing of believing a girl will marry him after just meeting him. Personally, I have never met an American like this and all the ones I know are just lovely, but this style of character seems to crop up far too often in English literature during the early 1900's. I have been informed that Agatha Christie's early books are not her best, but I thought it would be nice to start from the beginning and enjoy reading her work as it improves. It is an original cozy mystery and definitely worth a read. It is very English in it's ways, and the language in reminds me of the original 'St Trinians' films which were in black and white. Everything is 'jolly hockey sticks' and everyone is called ' old bean'. This is a delightful book that gives in an insight into England during the twenties. If you like cozy mysteries and the typical English novel, then this one is for you. Hi Viv! This one sounds jolly good! I've read one of Agatha Christie's books and enjoyed it very much. I'm glad you liked this one. It's a bit like the Americans always portraying us as upperclass snobby or bumbly (or both) with posh accents :P Stereotypes eh? 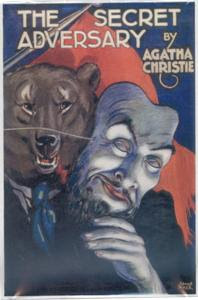 I am trying to think if I have read an Agatha Christie now - I'm sure I must have, Mum was a massive fan. Isn't that terrible that I can't remember. I love the cover of the book and would have been instantly attracted to read more. However, your review, especially the comment that it is loaded with typically British expressions, makes this a must read for me. I have not read any Agatha Christie yet - although I do have her first Miss Marple mystery, Murder at the Vicarage, sitting on my shelf. I never knew Agatha Christie's writing career began as the result of a bet. That's fascinating! I really do need to read one of her books. Alice - thank you. I do intend to read more. Ceri - I think Agatha Christie is so popular that it might put you off reading any of her books. I would never have been tempted, if someone hadn't told me how good they were. Carmen - You are right, the American portrayal of us used to be uppercrust snobs, how wrong they were. Mmm - stinky poodle fur, perhaps I will skip that one. Molly - you must read one. Amanda - you must too. Bermudaonion - it is mad isn't it, that her writing career came from a bet. There is hope for me yet. I'm so glad you enjoyed this so much. I have yet to read an Agatha Christie book! I still haven't read one of her stories, even though she's on my awesome author challenge list too. I tried listening to a short story by her and it almost put me to sleep while I was driving. I'm not giving up though. I'm sure I'll find one of her stories that I'll like. I've never read a whole book by her before. I tried reading Death on the Nile and gave up because I was getting the characters confused and thought it resembled Murder on the Orient Express too much (I've seen the movie). But this one looks good. I should check it out and give her another chance. I do very much like cosy mysteries and English novels, so I'll be sure to keep this in mind. Look in the right hand column of the blog page to see how to. I had no idea Agatha Christie had started writing as a result of a bet! I read The Mysterious Affair at Styles last year and really enjoyed it, so I'm going to check to see if my library has this one too. I like Agatha Christie and used to read her books back to back. Its been a while since I picked one up again. Great review, this one sounds good. I always like how she added plot twists and turns and all the different characters in her mysteries. What an interesting story about Agatha Christie! Even if she lost the initial bet, she ended up winning in the end. I love that you are going to keep on reading her books. It would be cool to see an author evolve in front of your eyes.